In what has turned out to be one of the biggest letdowns this year (even bigger than K. Stew and R. Pattz’s breakup), the European Central Bank (ECB) announced no rate cuts, no reactivation of the Securities Markets Program (SMP), and no immediate action to save the euro in its rate decision last Thursday. ECB President Mario Draghi had set high hopes for new supportive measures following his pledge “to do whatever it takes to preserve the euro” in London on July 26. With his bold statements, many believed that Draghi and his men would step up to the plate and take action in the ECB rate decision. Rumor had it that the ECB would announce aggressive and ambitious actions. Some even said the ECB would reintroduce the SMP to buy government bonds in the secondary market to lower borrowing costs. But I guess European policymakers had something else in mind, because all we got was more empty words. What baloney! Apparently, Draghi and his men didn’t see a reason to act as no countries in the euro zone had asked for financial assistance. To the dismay of the markets, Draghi said that the ECB could buy government bonds to lower borrowing costs of debt-trouble countries… but only if these countries ask for help from the EFSF and ESM and follow strict budgetary requirements. Now, in no way is that the first time that we heard such words from the ECB. Policymakers made it clear in the past that they won’t allow the central bank to exceed its own mandate. They’ve also called for governments to do their share in fixing their economies many times before. So basically, we didn’t hear anything new from the most recent ECB rate decision! Obviously, this wasn’t what the markets had expected, and they showed their disappointment on the charts. What Draghi giveth, Draghi also taketh away. 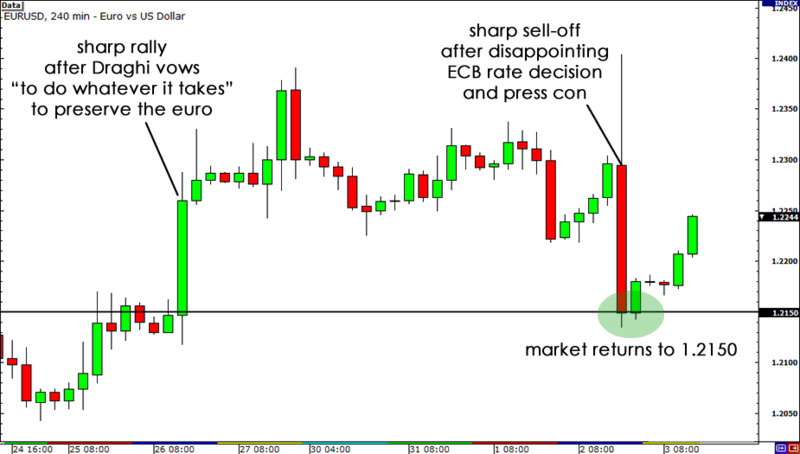 With the same speed that the euro had rallied following his vow on July 26, the euro dropped and fell back to 1.2150. Likewise, European bond yields retraced their footsteps. The markets simply returned to levels they were trading at before all of this “do-whatever-it-takes” hullabaloo. And rightfully so, if I may add! After all, it seems as though the euro zone is no better off now than it was before Draghi had made his pledge. Were you let down by the ECB rate decision?